Historic floods have deluged vast swaths of the Midwest - even flooding a third of the U.S. Air Force base that houses the nation's critical U.S. Strategic Command. But the National Ocean and Atmospheric Administration (NOAA) says the floods aren't nearly over. 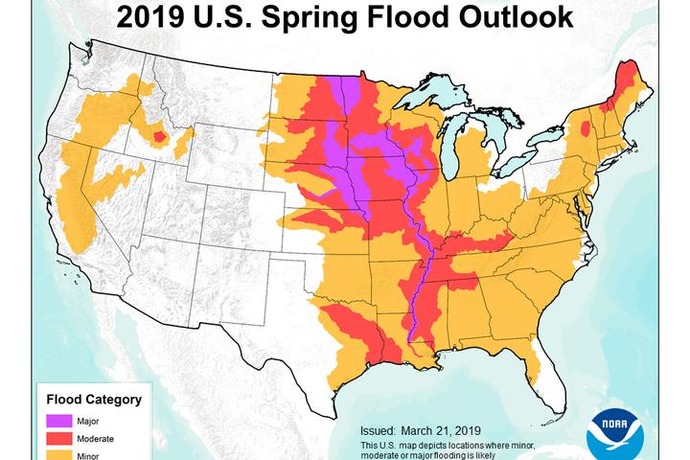 The agency's 2019 Spring Outlook found that nearly two-thirds of the lower 48 states are at risk for flooding in the coming months. "The extensive flooding we've seen in the past two weeks will continue through May and become more dire and may be exacerbated in the coming weeks as the water flows downstream," Ed Clark, director of NOAA's National Water Center, said in a statement. "This is shaping up to be a potentially unprecedented flood season, with more than 200 million people at risk for flooding in their communities." Regions in Nebraska, Minnesota, and Iowa have already seen historic flooding, with some major rivers - particularly the Missouri River - absolutely smashing previous flood records by some four feet. What's more, many of the nation's well-engineered levees have failed to contain the record floodwaters. The dramatic flooding - which is already forecast to cost well over $1 billion in damages - is consistent with a big uptick in heavy rains over the last half-century: Between 1958 and 2012, the amount of rain in the heaviest rainfall events in the Midwest shot up by a whopping 37 percent, according to U.S. government scientists. This is in large part due to Earth's changing atmosphere. Specifically, the climate has warmed by 1 degree Celsius (1.8 Fahrenheit), and because of simple physics, the warmer air is able to hold more water vapor. Specifically, for every 1 degree Celsius of warming, the air can hold seven percent more water. After the rapid melting of winter snow and deluges of rain in mid-March, NOAA expects the flood risk to continue as more rain falls and then travels down already overloaded rivers. "As this excess water flows downstream through the river basins, the flood threat will become worse and geographically more widespread," NOAA concluded. The agency forecasts flood risk by accounting for how much snow is left to melt, areas experiencing drought, how saturated soils are with moisture, the depth of frozen soil, the height of rivers, and expected precipitation. As the floodmap shows, regions near the Mississipi river and vast swaths of land in the Great Plains and Midwest are at risk for major and moderate flooding. After surveying conditions along the Nebraska-Iowa border on Thursday, Nebraska's State Patrol tweeted: "None of this is supposed to be under water."